In an attempt to be slightly healthier, instead of making crab cakes, I made some cod cakes for me and my mom one night. 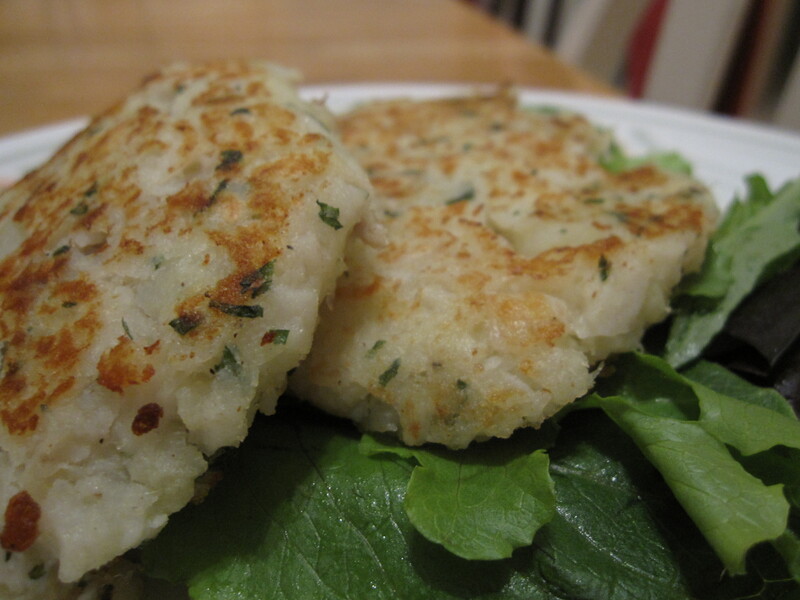 Ingredients: 2 large potatoes, 1 pound cod, 1 tablespoon butter, 1 tablespoon chopped parsley, 1 egg, S&P. Directions: Bring large pot of water to boil and cook potatoes until almost tender. Add fish to the pot and cook until both are soft. Drain potatoes and fish and transfer to a large mixing bowl. Add butter, parsley, egg, and S&P to bowl; mash mixture together. Mold the mixture into patties and fry the patties on both sides in a skillet until golden brown. The recipe made well over 8 patties. Verdict? The patties were too much potato and we couldn’t fully taste the cod. I wish we had ketchup in our fridge. If I were to make this again, I’d probably only use one instead of two potatoes. Other than that, the cakes tasted pretty good. They were easy to make and would be a great dinner party appetizer.